Militarism could exacerbate problems already emerging in their drifting economic ties. Both Japanese Prime Minister Shinzo Abe and the Chinese leadership have been directing their comments at each other so far this week, with each in the middle of very important state visits. It would appear that Japan’s recent change to its once overtly pacifist constitution and, as my colleague Zach pointed out, Abe’s joint announcement with Australian Prime Minister Tony Abbott that the two countries plan to cooperate in producing submarines are the proximate cause of this latest round of public statements. While Chinese President Xi Jinping and Premier Li Keqiang have sought to again draw attention to Japan’s Imperial Army past, Abe is seeking to assuage concerns in China and elsewhere about Japan’s recent turn toward a normalized military posture. However, neither side is willing to address the emerging regional security imbalance that is at the root of their increasingly vitriolic relationship. Li made similar statements while speaking to reporters with German Chancellor Angela Merkel, who began a three day visit on Monday aimed at strengthening economic ties. Li also continued China’s recent tactic of praising Germany’s postwar stance on its own wartime atrocities, in order to highlight Japan’s military normalization and its questioning of the use of comfort women during the Second World War. Diplomatic sources told Reuters that Germany (again) does not wish its wartime past to be used by China in its dispute with Japan, and Merkel did not refer to the war in her comments. On Sunday, China launched a website to promote memories of the Nanjing Massacre, and on Monday state TV showed scenes of the trial of Japanese war criminals from 1956. China’s statements are not without context. Aside from Japan’s new interpretation of collective self-defense last week, and this week’s deal with Australia to enhance defense technology trade, Abe told the Japan News in an interview last weekend that he will appoint a state minister within the Cabinet to push legislation codifying collective self-defense in either the special Diet session this fall, or its regular session next year. The Ministry of Defense also announced on Tuesday it plans to introduce two new high-altitude, long-range drones in 2018, in order to monitor severe weather as well as remote islands, a reference to the ongoing dispute with China over the Senkaku/Diaoyu Islands. The problem however is not that the two countries do not understand each other’s position, although they will continue to question each other’s motives. The problem stems from China’s recent assertion of power in what it considers to be its strategic territorial waters in the South and East China Seas. While these claims are not necessarily new, China’s ability to enforce its authority is, and this has thrown the regional security calculus out of balance. 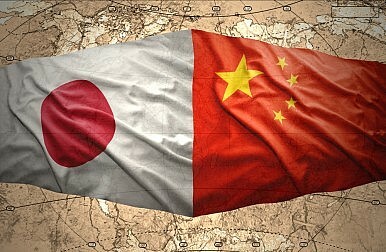 China’s ascendance as a problem for Japan is exacerbated by the reluctance of the U.S. (especially after two long and costly wars in Afghanistan and Iraq) to guarantee regional security as it did during the Cold War, however much it emphasizes its Asian “pivot.” The close economic ties between and China and Japan, usually heralded by analysts as the thing which will prevent them from ever descending into conflict, have also weakened since the current dispute began in 2012. Japan is actively pursuing new economic partnerships in Southeast Asia where labor is cheaper and diplomatic ties are more solid, and is also looking to dramatically increase the percentage of its energy imports that avoid the South China Sea, where China is likely to continue asserting its control. It’s possible that by separating their economic ties and isolating themselves from each other’s jurisdiction over trade routes, the two sides may be able to reduce tension overall. It is also equally likely that a reduction in the shared nature of their economic future could lower the bar for future conflict. Shinzo Abe's long-awaited trip to China brought a raft of deals, but no major breakthroughs.